Often charts are used to display information for certain period in time. 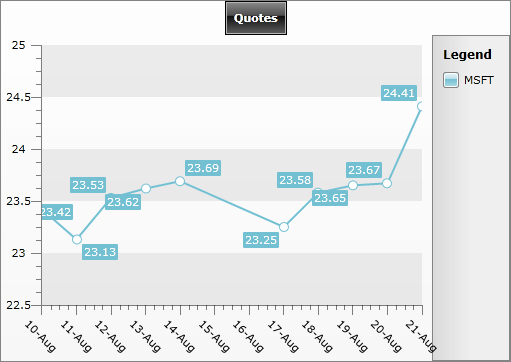 RadChart provides full support of DateTime values and allows you to show dates on the X-Axis. 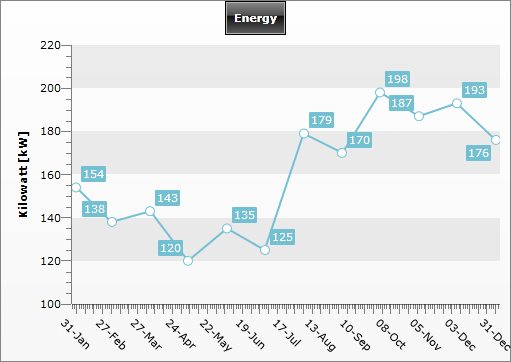 You can populate your chart with DateTime values by using SeriesMapping or DataPoints. Take a look at the Populating with Data topic for more details. DataPoint.XValue is of type double. Therefore, the DateTime values have to be converted to OLE Automation dates first: see DateTime.ToOADate(). The AxisX.IsDateTime should be set to True. Note how the values are defined in the XAML - this is the OLE Automation equivalent of the dates. In the code behind, ToOADate() method is used to convert the dates and then the value is set to the XValue property of the DataPoint class. The same logic is used when specifying the AxisX.MinValue and AxisX.MaxValue. This example also demonstrates how to customize the X-axis by disabling AutoRange and how to configure the axis manually.